"Part Buddhist monastery and part petting zoo, the Tiger Temple, in western Thailand, has long been the bane of conservationists and animal rights activists. They accuse it of abuse and exploitation even as it offers tourists an Edenesque wildlife fantasy. The temple — which brings in $5.7 million a year from ticket sales — promotes itself as a place where tigers coexist with humans in Buddhist harmony. 15 years ago, villagers took an injured cub to the local abbot. Word spread, and soon there were 6 tigers. Now, after complaints of trafficking in endangered species, the Thai government is trying to shut down the Tiger Temple, where the population currently stands at 138 — not counting 10 tigers already removed by the government. But there are 2 obstacles: the temple, which has gone to court to block the closing, and the #tigers. What do you do with nearly 150 carnivorous cats raised in captivity? 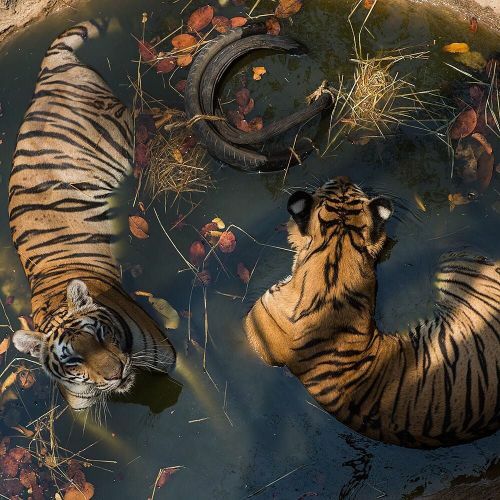 @amandamustard photographed a pair of tigers cooling off at the Tiger Temple in March. Visit the link in our profile to read more." By nytimes on Instagram.